Cauliflowers are not the easiest of crops to grow, but they are one of the most rewarding, both in a sense of achievement and in the eating. Like so many of our vegetables, their origins are rather obscure. The Romans are thought to have cultivated a type of cauliflower, but the vegetable as we know it today originated in the countries at the eastern end of the Mediterranean at a much later date. It was introduced into Italy in the late 15th century and finally reached Britain about a hundred years later. However it was another two hundred years before it came to be widely grown. Cauliflowers are characterized by their large, dome-shaped heads of creamy-white flowers (which are generally known as “curds”). When well-grown, these should be tight, evenly shaped and unblemished. The typical cauliflower has creamy-white curds, but there are also other colours for those who want some­thing a bit different. Purple is the most common alternative colour, hut there are also various shades of green and orange, although most of these are not true cauli­flowers but hybrids, often produced using broccoli. The heads are usually 15—20cm/ 6-8in across, but there are now modern hybrids, often known as mini-cauliflowers, which develop very quickly and have heads to only 10cm/4in or less across. For those with the space to grow them there are cauliflowers for almost even season of the year. 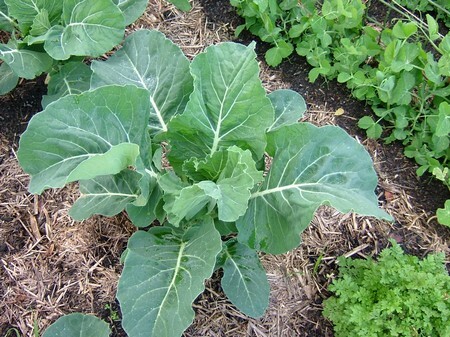 The only gap comes in winter, because most of the so-called winter cauliflower are not, in fact, ready until spring. Cauliflowers can be awkward to grow, but, with care and attention, all gardeners should be able to produce good-quality crops. The main factor is to make sure that the plants growth is not checked, because this causes irregular and undersized curds. An irregular water supply can be one cause. Late transplanting may be another. The one aspect that is difficult for the gardener to control is high summer temperatures, which are not conducive to growing good cauliflowers, since they prefer cool conditions. In hot areas you may have to abandon the idea of summer cauliflowers and concentrate on winter varieties. Cauliflowers should be planted in an open, sunny position. To grow cauliflowers well it is essential that you have a fertile soil, preferably manured during digging in autumn. The manure is important, because the soil should be moisture-retentive so that the plants are not checked during dry periods. The soil must not be too acid; if possible adjust the pH level to 6.5—7 by liming in autumn. 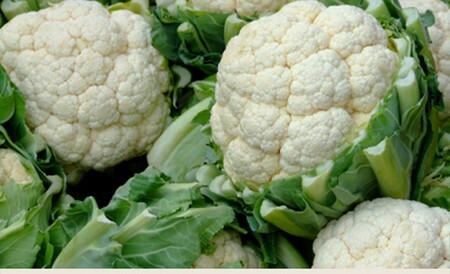 Cauliflowers can be sown in the open ground or in modules or trays. They should be sown thinly in shallow drills about 1cm deep and 20cm apart. For the timing for the various seasons, check the Cultivation box. If necessary, thin the seedlings to about 5cm/2in apart. Transplant them when they have five leaves, which should be about six weeks after sowing. Water the rows of seedlings on the day and then transplant them using a dibber or trowel. Firm the soil around the plant down well with your heel. The planting distances vary from 50-75cm/ 20—30in, depending on the variety: compare Varieties with Cultivation box. Keep cauliflowers well watered, especially in warm, dry spells. Once the curds begin to form, snap the larger outside leaves down over them to protect them. This will prevent discoloration. The curds are ready when they form an even dome shape. Summer and autumn varieties mature in about 16 weeks from sowing and winter ones in about 40 weeks. Mini varieties are ready in about 15 weeks. When they are ready, cut through the stem with a sharp knife just below the head, leaving one or two leaves around the curd to protect it on its way to the kitchen. It you are storing them for a while, cut them so that they have a short length of stem from which you can hang them. If the leaves are occasionally sprayed with water, they will keep for several weeks in cool conditions. In general, it is best to leave the cauliflowers on the plants until they are required, but they can be cut and placed in a cool place for up to three weeks. They store best if they are hung upside down, otherwise cauliflowers will freeze well. Cauliflowers are susceptible to the same problems as cabbages.